The year was interesting in a lot of other ways, but I mean "interesting" in the sense of "science experiment gone horribly wrong". I'm not even going to start on that, but cupcakes have helped get me through, and so has posting here regularly. It's time spent focusing on something productive, instead of sitting back and let everything wash over me. July 2011 - Carrot Cupcakes with Cream Cheese Frosting (GF). These were my first foray into gluten free cupcakery, and I was suitably impressed by how they turned out. That is to say, I wasn't disheartened as I imagine I may have been if the pumpkin cupcakes (see below) had been my first attempt. August 2011 - Rosewater Cupcakes with Pistachio Frosting (GF). I love rosewater as a flavouring. I don't think I got the icing right because I didn't have a lot of experience in buttercream back then - it was too butter and could use the addition of milk to thin it if you're going to make them - but I'm learning! 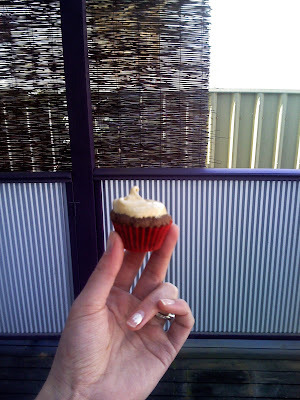 September 2011 - The Ultimate Vanilla Cupcake (GF). Also, HAHAHA - I just realised that this page has had the greatest number of hits of any on this blog. And why, pray tell? Because it contains a picture of Ryan Gosling with his shirt off! November 2011 - Pumpkin Cupcakes with Vanilla Icecream Frosting (GF). These were a little bit concave. I'm not quite sure what went wrong; maybe it was that there was too much moisture in the pumpkin, or maybe it was always going to be one of those gluten free cakes that will never perform like you want it to. But what it lacked in altitude it more than made up for in taste (plus, because you have to backfill the pothole with icing, you get more icing!). These will definitely be made again. 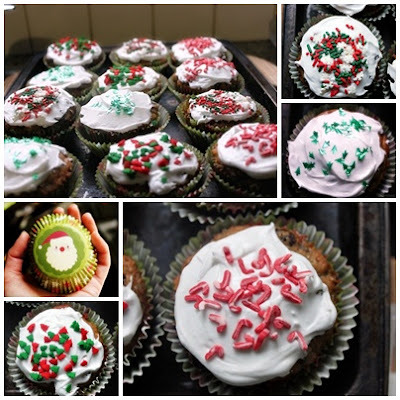 December 2011 - Christmas Cupcakes. Basically tiny little Christmas cakes, only without the drawn-out faffing about with soaking fruit in brandy for three days and cooking it for two and a half hours at a low temperature. Be careful not to overcook them because nobody likes dry fruitcake. Unless it's swimming in custard... which gives me an awesome idea for NEXT Christmas! I'll give you a hint: it involves injecting the cupcakes with something tasty. I'm officially a genius. 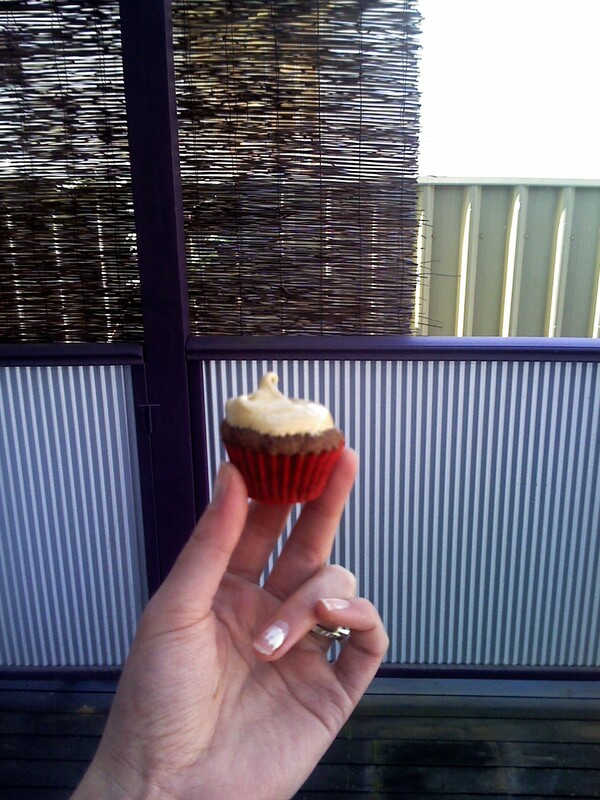 January 2012 - Chai Cupcakes with Caramel Frosting (GF). These were another absolute winner, not the least because they actually rose! I think the fact that I was so attracted to these, as well as to the pumpkin cupcakes, tells me that I like the spices that are common to both cupcakes. What can I say - I'm a spicy lass ;) Pity that the icing looks a little like poo, though. February 2012 - Vanilla Cupcakes with Whipped Ganache Filling. I was a little low on inspiration in February. Life was busy kicking me in the pants so I figured the best way to deal with that was with chocolate. But not too much chocolate. So I made vanilla cupcake... and then filled and iced it with chocolate. The fact that the vanilla cupcake was just a means for getting chocolate into my mouth is irrelevant! I also just really wanted to use these super-cute sprinkles. March 2012 - St Patrick's Day Irish Soda Bread Cupcakes with Whiskey Frosting. Oh yes, you can put whiskey into your icing, to be sure, to be sure! The cupcakes were a little odd because they were almost semi-savoury on account of the addition of caraway seeds, which I feel worked well with the icing. They also taste healthier than normal cupcakes because of the savoury-ness but, eyeballing the ingredients, this is but an illusion. April 2012 #1 - Chocolate Heartache Cupcakes with Maple-Goat Cheese Frosting (GF). Wow. Just, wow. YOU NEED TO EAT THESE NOW!!! These contain no butter and no flour - eggplant takes the place of both. Which I would like to imagine makes them healthy, but we all know how chronically I suffer from imaginitis when it comes to that massive blind spot called my stomach! Now, if there was eggplant but no 200g of honey, and no 300g of dark chocolate, THEN I might be on the right track with imagining that they're healthy. Actually, honestly, they are a healthier alternative to your usual mud cake - eggplant contains nutrients that flour and butter don't but without the gluten or quite as many calories, and is also far lower GI than flour. But really, who cares. You need to eat them. Now. April 2012 #2 - Apricot Upside-Down Cakes. I chose these ones because they appeared to be relatively low calorie (for a cupcake), as well as being slightly better for you on account of using wholemeal flour and containing fruit. And now, ladies and gentlemen, May 2012 brings us Coca-Cola Cupcakes with Peanut Butter Frosting! This recipe is from SprinkleBakes.com and I halved the icing recipe... and still have enough left over to ice a few more cupcakes! I imagine if I got my pretty piping tips out I may have used it all up, but it's just so rich that I decided that less is definitely more. Preheat oven to 175oC. Line 12-hole cupcake tin with cupcake liners (note that the mixture will stain the liner, so, if you observe the photos in the original recipe (link above), you'll noticed that the lovely Heather placed her cupcakes inside a second wrapper. I don't know whether that was for effect or because of the staining, but mine discoloured quite badly). Heat coke, cocoa powder and butter in saucepan until butter melts. Add sugars and whisk until dissolved. Cool to room temperature then add the egg, lightly whisked. Meanwhile, mix remaining dry ingredients in a larger bowl, then add coke mixture to it and mix. Divide amongst 12 cupcake liners and bake at 175oC (350oF) for 20-25 minutes, until cake springs back when touched. Optional: sea salt, chocolate jimmies and crushed peanuts to serve. Mix butters, sugar and salt until even in consistency and fairly smooth. Add milk slowly until you achieve the fluffiness you desire. Ice cupcakes when totally cooled. Attempt to disregard the fact they contain in excess of FOUR HUNDRED CALORIES EACH!!! As I said, super-high calorie... but also super-delicious. I never expected peanuts to go so well with Coke, but I suppose, when I think about it, I have eaten them together before. and by "posed" I mean "posted" oops! Chocolate Heartache Cupcakes with Maple-Goat Cheese Frosting.. now that is something I have to try, if just to taste the frosting... Thanks for sharing. Looks like a very yummy 11 months to me :) !! All those cupcakes look amazing! Your pistachio frosting sounds awesome too, I've never seen that before, love your recipe round-up! I love the sound of coke cupcakes (like any true addict!) but in this house we cant do the peanut butter icing! Any other ideas on what I could put ontop? My personal fav would be coke cupcake with coke icing paired with a can of coke but that is just me! Most supermarkets stock "free nut butter" in their health food section, which is a peanut free, gluten free alternative to good ol' PB. I think it might be a blend of sunflower or perhaps sesame and cashew. It tastes quite similar and would make a good substitute, although you may wish to add a little salt.